Lasting Impression: The usefulness of this app cannot be overstated.Â Features, ease of use, and convenience make this the go-to weather app for Android. Nitty Gritty: Weatherbug gives you the information you want and makes the process easy. The best feature of the app is the notification service. Once a location is set (either by the userâ€™s current position or manually choosing), the current temperature is displayed in the notification bar. If you drag down the notification bar the current temperature and forecast are both displayed. There is no need to open the app; the data refreshes periodically. Best of all, there was no noticeable hit on battery life from this service. This feature sets a new standard for weather apps because it just makes sense. Weatherbug also offers a plethora of other features. 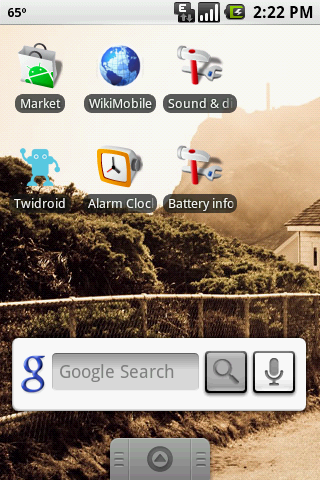 Weatherbug makes full use of Android, interacting with other applications seamlessly. 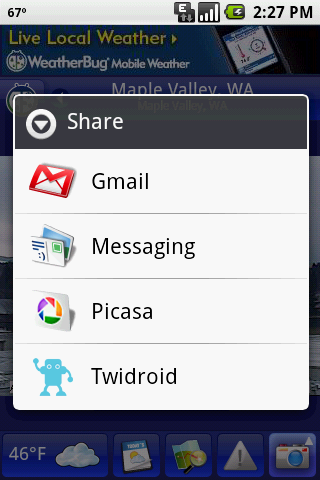 At any point you can take a screenshot of what you are seeing and send it via Gmail, Picasa, MMS, or Twidroid. All methods work as expected. The UI is well executed. Smooth animations, icons, and readable text make navigating simple and fluid. 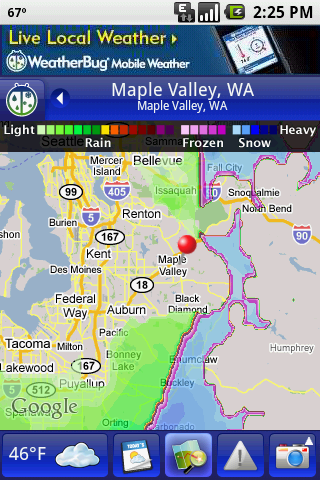 The maps section has an overlay displaying radar, temperature, or satellite imagery that is impressive, even letting the user specify the opacity of the layer in real-time. Screen space is well utilized (except the banner link to their webpage at the top). Settings are standard with the extra ability to choose between English/Metric units. Connections are smooth and reliable, even over EDGE. Data is pulled from the cloud quickly, displaying data within seconds. Video plays over EDGE, 3G, or WiFi but EDGE is not as reliable since a lost connection may result in an error message. 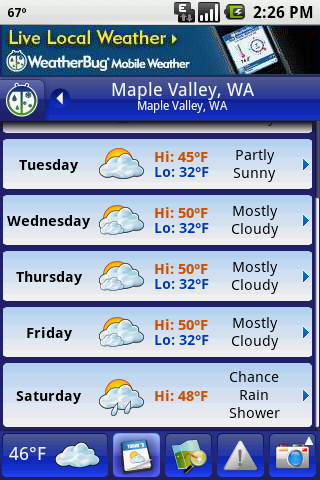 Weatherbug is sophisticated in that it adjusts to the user. It offers the basic information you want, but its easy use will entice you to discover the deeper features. Simply put, it has become the sole weather app on my G1.